Marissa Gonzales’ educational experience is not an uncommon one. The School of Interactive Computing Ph.D. student grew up in California, where she attended an exclusive high school populated, more or less, by students of privilege who had the time and resources to engage with educators, devote themselves to their studies, and ultimately come out of high school with the skills necessary for academic success. But Gonzales wasn’t like most of her classmates. It took a lot of effort on both her and her mom’s part to make her time in high school a success. Each day, Gonzales woke up at 4:30 a.m. so that her mom could take her to school in time to make it to work early in the morning. She made it to the high school about an hour and a half early every day and then, after school, went straight to her job at a t-shirt printing shop. There, Gonzales worked evenings to earn money to help supplement her family’s income, a practice she continued when she attended the University of California, Irvine. She paid her own student loans and sent money home to help her family make ends meet. School, she said, was like an obstacle. Gonzales’ story can be told by millions of other Americans. For most, that’s where the story ends – an educational deficit never closed because of a lack of access and resources. For her, though, that experience has served as inspiration for her research into the benefits and pitfalls of online educational environments. Gonzales believes that online learning has potential to reach students who, like herself, had limited access to one of the fundamental components of education: time. Online learning has opened up opportunities for students to learn asynchronously from one another, allowing them to participate in courses as their schedules allow for it. Degrees like the Georgia Tech Online Master of Science in Computer Science (OMSCS) program, which has made enormous breakthroughs and turned online learning on its head, aim to broaden access to these types of students. Many in Gonzales’ position are unable to achieve similar results in traditional education. In theory, by making quality education available online, online learning could provide the same opportunity to those underserved communities. But what are the properties of a flourishing online classroom? Why do they work? Who do they work for? And, ultimately, how can the academic community design environments that provide access to quality higher education for all? Gonzales came to Georgia Tech in 2016 to pursue her Ph.D. after graduating from Irvine with a degree in informatics, concentrating on human-computer interaction. When she arrived, she approached Professor Ashok Goel, who had just achieved international attention for Jill Watson, an artificially intelligent teaching assistant that answered students’ questions in the online section of his Knowledge-Based AI class. Initially, she saw the opportunity as one to evaluate the system. How did it affect the students? Was it helping them become more engaged or helping overall grades? As she began to dig in to the project, though, she realized that there was an opportunity and a need for more. “When we learn, there’s a lot of factors that affect how we learn or affect our feeling about learning, about the classroom, the teacher, the material,” Gonzales explained. “How much do we value the experience and how much does that value impact our overall performance? Do we feel like we’re getting something out of it? Are we learning to use specific strategies for academic improvement and reflecting on our performance? As she dug, Gonzales concluded that she needed to evaluate more than just how AIs could ease the load on teaching staff, making them more available to provide additional in-depth assistance to students online. Instead, she needed to take a more holistic view about the students’ online experience. Since she began, Gonzales has performed evaluations after each semester for both the residential and online sections of the Knowledge-Based AI class in which Jill Watson and other AIs are used. The goal is to gain a more complete understanding of the online educational experience and how the design and implementation of these AI assistants, among other design decisions in online learning environments, can help or hurt the process of offering quality education online. Online learning, Gonzales said, isn’t going anywhere anytime soon. As OMSCS has shown, a quality education can be achieved beyond just a residential program. But it is important that researchers get in front of potential future challenges as online opportunities become more common. 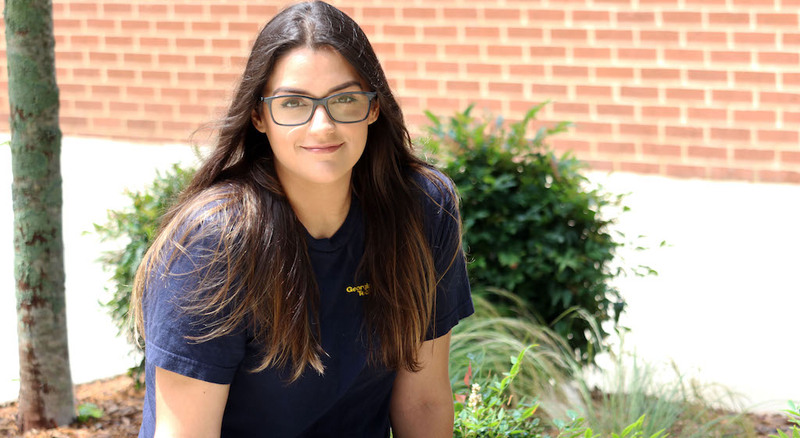 In her two years at Georgia Tech, Gonzales has been awarded the Goizueta Foundation Fellowship, which is designed to help attract and promote doctoral students of Hispanic/Latino origin, and the Intel Diversity Fellowship from the Georgia Tech Focus Program. She aims to pick her dissertation topic in the next few months and is on track to complete her degree in 2021.